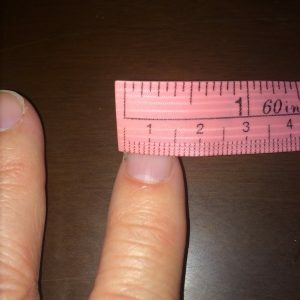 Measure your fingernails to see which is closest to 1cm – now you will always have a 1cm “ruler” with which to measure lesions, lacerations, discolorations, etc. I have actually taken this a step further and have measured my index finger and thumb to various knuckles. Tip of my index finger to PIP is 6cm; tip of index finger to MCP is 10 cm. Tip of thumb to DIP is 3.5cm, width of thumb is 2cm. Thus,I always have a ruler “handy”! Love the pun! My ruler is so much smaller… tip of index to PIP is only 4cm and tip of index to MCP is 7cm. But now I know – great idea!